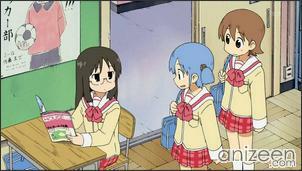 Nichijou suggests a story of simple, everyday school life, but the contents are more the opposite. The setting is a strange school where you may see the principal wrestle a deer or a robot’s arm hide a rollcake. However there are still normal stories. 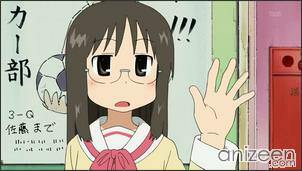 While chasing after a cat that stole her breakfast, Nano Shinonome runs into a student and blows up and winds herself up on a roof with a missing arm. 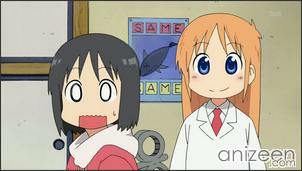 In the meantime, Yuuko Aioi goes through desperate means to keep her octopus sausage from being sullied, while Koujirou Sasahara makes a scene at the school’s opening ceremony over bringing his goat to school only to be shot and reprimanded by Misato Tachibana and Yuuko tricks Mio into pressing the fire alarm. 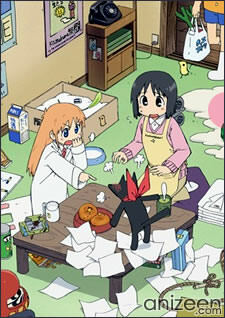 Later, Nano begs her creator, the ‘Professor’, to remove the noticeable windup key on her back, but she refuses on the grounds that ‘it’s cute’. 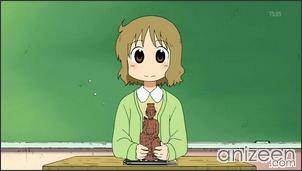 Nichijou is so random that no matter how hard you try, you can never explain in words just how random it is. 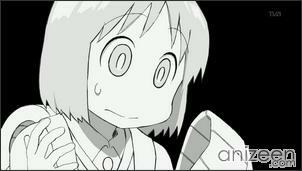 This anime has quite a few funny moments to it, all of which are completely and utterly ridiculous. So, if you want to have just fun, give it a try, and don’t expect something really complex. 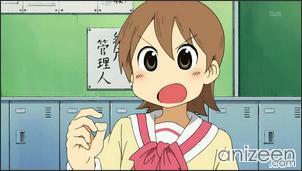 Yuuko Aioi is an energetic high school girl. One of her negative sides is that she is often too lazy to do her own homework and always copies from either Mio or Mai..
Mio Naganohara is a bright and cheerful girl sporting light blue hair and pigtails hold by two small wooden cubes. She has a crush on Koujirou. 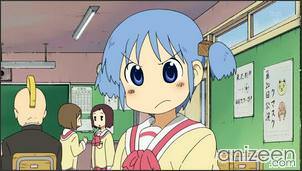 Mai Minakami is a rather quiet girl who is very intelligent. 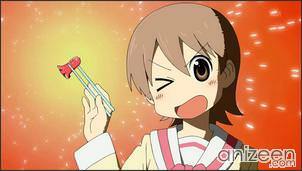 She is seen to be multitalented, excelling at using projectiles, arm wrestling, and even pranking. Nano Shinonome is a robotic schoolgirl that was built by Professor. She often worries about keeping her identity as a robot from her classmates, despite the fact everyone already knows about it due to the noticeable wind-up key exposed on her back. Koujirou Sasahara is a rich flamboyant high school boy who likes to think he is an aristocrat when in reality his family are just farmers. He likes to ride his goat to school and is often seen with his butler. Professor is an eight-year-old mad scientist who created Nano, often making various adjustments to her without her noticing but never getting round to removing the obvious wind-up key from her back. Despite her intellect, she still acts like any child of her age. Her favorite animal is the shark. 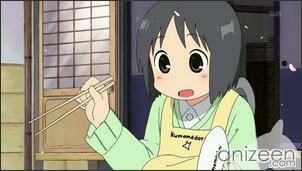 Nichijou (日常) is a Japanese comedy manga by Keiichi Arawi. 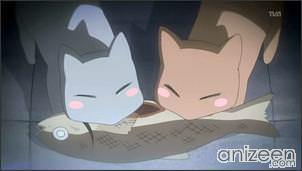 The manga began serialization in the December 2006 issue of Kadokawa Shoten’s manga magazine Shounen Ace, and was also serialized in Comptiq. 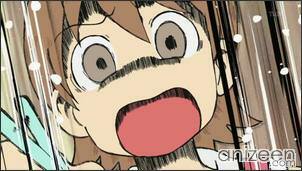 An anime adaptation by Kyoto Animation began airing in Japan in April 3, 2011. A PlayStation Portable game by Kadokawa Games will be released in July 2011. 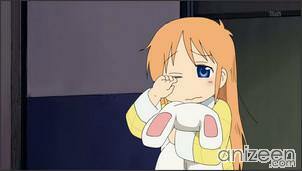 Ending Theme: “Zzz” by Sayaka Sasaki; “Zzz (A cappella)” by Sayaka Sasaki ep 7-9; “Zzz (Bossa Nova)” by Sayaka Sasaki ep 10-12; “Tsubasa o Kudasai” by Sayaka Sasaki ep 14; “Kikyuu ni Notte Doko made mo” by Nano Shinonome, Hakase, Sakamoto-san ep 15; “My Ballad” by Sayaka Sasaki ep 16; “Kaijyuu no Ballad” By Yuuko, Mio, Mai ep 17; “Green Green” by Sayaka Sasaki ep 18.